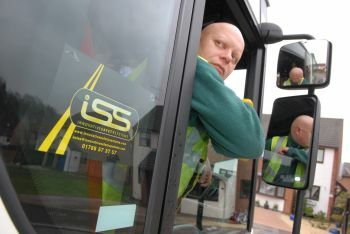 In response to this week’s announcement by the Health and Safety Executive that injury rates in waste and recycling remain too high, vehicle safety experts, Innovative Safety Systems Ltd are encouraging local authorities, manufacturers and private contractors to install CCTV mobile monitoring technology and rear vision systems to their Refuse Vehicles (RCV’s), to reduce the risk of accidents. Although there have been signs of improvement across the sector the HSE reports that the combined fatal and major injury rate in waste and recycling is more than four times the average across all industries. In its ‘Waste and Recycling Vehicles in Street Collection’ good practice document the HSE goes further to stipulate that such equipment must be designed and fitted correctly in order to optimize the operator’s field of vision during reversing, and that cameras and monitors should provide a good view of the working zone, both in sunlight and low light levels. The HSE also recommends that high-visibility warning lights and beacons should be fitted to the front and rear of RCV’s. Gavin continued: “We offer a complete package of traditional and LED lighting and beacon packages. LED lighting is becoming more popular as it is brighter, more reliable and more robust than traditional bulbs. It also requires a fraction of the energy to function, so council’s can improve the safety of their vehicles, whilst saving money on maintenance, repairs and ‘down time’. In April this year Caerphilly County Borough Council took delivery of five new RCV’s all fitted with ISS Hard Disk Recording.